Today Microsoft and Google are actively developing the potentially revolutionary technology of quantum computing. In the coming weeks, they will announce the breakthrough results that they have been able to achieve, but it is not yet clear whether quantum computers will be able to solve real problems, writes the Financial Times. Two of the world's largest technology companies, Microsoft and Google, are preparing to announce the results of their developments in the field of quantum computing. Representatives of companies say that quantum computers that work much faster than conventional computers will be used in the next five years - much earlier than even in the most optimistic forecasts. "We have the opportunity to solve a number of problems that could not have been resolved before," says Todd Holmdahl, head of the Microsoft quantum team. "To solve such problems on an ordinary computer, it took time equal to the existence of the universe." Canadian company DWave began to sell a simplified type of quantum computer seven years ago. But this is not something that Google and Microsoft are working on. Their goal is to develop a universal quantum computer that can be programmed to handle a variety of tasks that are beyond the control of modern computers. To do this, Microsoft has been working for 12 years to create a working qubit, or quantum bit - the basic building block of calculations for quantum machines. According to Todd Holmdal, the company is more "close" to the announcement than ever that the working qubit has become a reality. However, creating a working qubit - if Microsoft really does this - is just the first step. Another expected milestone, from Google, will be a demonstration of a quantum machine that solves a problem beyond the control of a conventional computer. This moment, when quantum machines will surpass even the most powerful classical systems, is known as "quantum superiority". Google promised to do this by the end of 2017, but so far the results have not been announced. Other companies working with this technology say that the forecasts of IT giants are too optimistic. "We are still living in an era of toy systems," says Intel Labs head Mike Mayberry. - It is not yet clear which of the competing qubit technologies will prove to be the most effective. Ahead of us is a decade-long race between major technology companies, before a really efficient technology appears. " 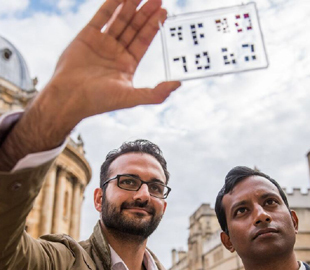 Startup Bodle Technologies, founded by Oxford graduates, is developing a new type of solid-state display, which allows to significantly reduce the energy consumption, up to the point that in some cases it does not require electricity at all. Charging the battery of wearable devices, IoT-devices and smartphones is one of the main problems of the industry and a serious obstacle to their widespread distribution. Its solution can be approached in various ways, from improving power management programs and creating more efficient microchips to increasing battery capacity. But since the display spends most of its energy, why not first deal with it? The main feature of solid-state reflective displays is that they are not illuminated. The screen uses other available light sources - sunlight, electric lighting and the like. The startup team assures that their displays are able to display HD video and at the same time spend much less energy. In this case, the screen can be of any size and shape. The technology of the startup is based on the invention of the professor of Oxford University Harisha Bhaskaran and Dr. Peyman Hosseini, which can be used for both flexible and hard displays: the pixels simply reflect light, greatly reducing the need for energy in the case of dynamic images and reducing it to nothing - in case of static. The color of the image gives the effect of structural interference, whereas the change in the reflection coefficient of the hyperfine layer of the material with an easy transition from one phase to the other creates a dynamic color display. These materials have a sufficiently high refresh rate to show high-quality video. An additional advantage of this technology is that such displays are thin as paper, inexpensive, work well in the open air and less strain the eyes, compared to LCD or OLED. They can be used in wearable devices, Internet devices of things or electronic books. And in the near future - to print posters, posters and signs from this material, writes TechCrunch. The user of the Chinese social network Weibo published photos allegedly made at the closed presentation of the new flagship smartphone Vivo Xplay 7. Rumors about this device began appearing last year, but until now they were not backed up by any real plausible leaks. Judging by the latest data, with the upcoming novelty Vivo is going to leave competitors far behind. Vivo Xplay 7 will receive a virtually frameless display that occupies 92.9% of the front side area. The leader in this parameter today is Essential Phone - 85%. At iPhone X it makes 82,9%. In addition, the new flagship Vivo will have an eight-core Snapdragon 845 processor, 10 GB of RAM, a storage of up to 512 GB, a dual camera with a four-fold zoom without loss of quality, a built-in fingerprint scanner and improved Face Unlock second-generation facial recognition. The timing of the release of Vivo Xplay 7 is still no information. The software is created to enable physicians to start resuscitation in advance. Leading Google researchers are trying to create software that will predict the patient's medical result as soon as he gets to the hospital, according to Quartz. The researchers state that they have succeeded in achieving significantly better results than existing systems of prediction of treatment results. In particular, the possibility to predict the probability of death of the patient within the next 24 hours or two. To do this, the experts had to collect the data of 216,221 adult patients with 46 billion data points. They cover a total of 11 years in two hospitals: the San Francisco Medical Center (2012-2016) and the University of Chicago Medicine (2009-2016). To decipher the notes of physicians made by hand, as well as all other available data of patients, they applied three complex neural networks of in-depth training. As a result, they must determine which of the data has the greatest impact on the final result of the diagnosis. This forecast is made by the consulting company Accenture. Its analysts predict that in the next 5 years, companies that invest in AI and staff training relevant skills, will be able to increase their revenues by 38%, writes Fast Company. At the same time, those who ignore this area, on the contrary, will lose in profits, analysts promise. Specialists from Accenture say that they analyzed 1200 world leading companies, studied data on 14,000 workers. In the end, they argue: "If 500 companies with the largest market capitalization will begin to pay the same attention to AI as the first 50, then each of them will be able to increase revenues by an average of $ 7.5 billion annually. It will also add 5,000 new jobs. All these changes can happen in 5 years ". Investments in AI include, in the first place, expenditures on personnel training and education. The agency believes that companies must recycle their device for joint work of algorithms and people. And 67% of the interrogated workers stated that they want and are ready to be trained. They understand the need to improve their skills. 45% believe that this will help to significantly improve the quality of the work they do. But only 3% of executives are ready to invest in training and training. And of all the companies, only 29% have somehow adjusted themselves to the arrival of AI in the work process. The head of Google Sundar Pichai also spoke about the need to learn how to interact with AI. The Google CEO recognized artificial intelligence as one of the most important discoveries in the history of mankind. However, in order to get the maximum from this achievement, people will have to learn how to handle it. Like Accenture, the head of Google considers primary education and investment in it. The main tool in the fight against unemployment, he believes regular training programs available to the masses. People should have access to courses that can be mastered in a short period of time. First of all it concerns basic digital skills and soft skills. A positive outlook on the impact of AI was given by Gartner. By 2020, artificial intelligence technologies will create half a million more jobs than they can destroy. By 2025, the number of new vacancies created thanks to AI will surpass the number of robots taken by robots even more - by more than 2 million. "Robots will not take our jobs, they will give us a boost. 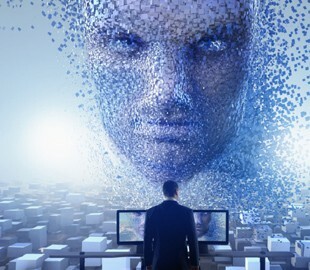 It is from this position that we must consider AI, "said the head of research at Gartner, Manjunat Bhat.